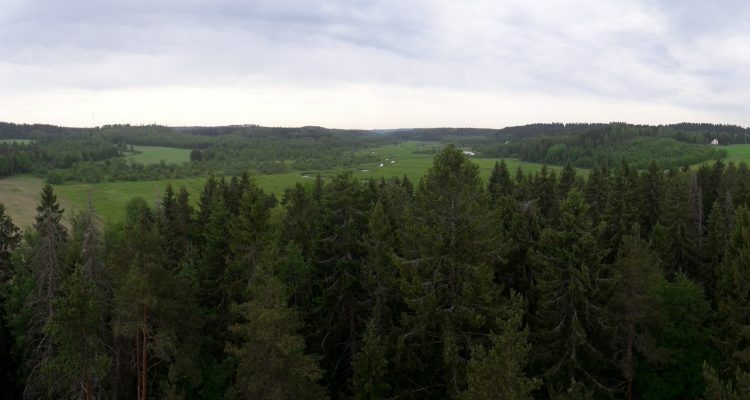 When I was climbing up the seemingly-endless stairs of the observation tower in Luhdanjohki, I wondered why I always seem to choose places to see that are very high up. It’s not that I’m afraid of heights but I just always feel that by the time I get up to the top, I know I seriously need to exercise more. In any case, my little teenage friends were almost flying up the stairs and didn’t seem winded at all. Well, good for them! How did we end up in a tower then? Well, some teenage relatives of mine were visiting me so we decided to make one of our yearly trips to a place we have never been to. 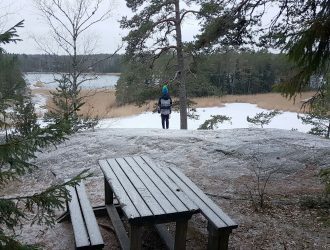 This time we decided we wanted to go to a few viewpoints and enjoy the wonderful landscapes of Finland. 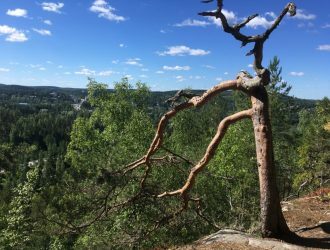 As we were passing through Lahti on our way towards central Finland, the Luhdanjoki observation tower in Hollola was the perfect spot. 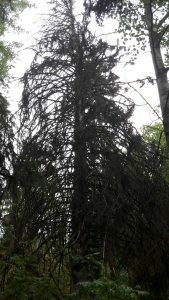 It is one of the tallest in Finland so we were guaranteed good views. The drive was easy but when we got to the address my navigator pointed me to, I saw nothing. 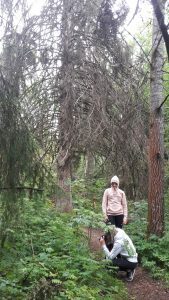 We drove a little bit further along the gravel road and found a small clearing suitable for parking cars. We got out and went on a walkabout. The observation tower was on top of a small hill, about 50m from the road. 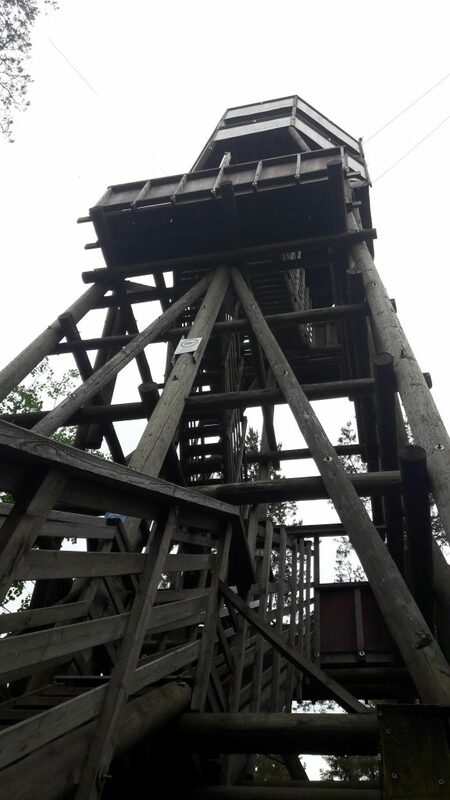 It had been drizzling a bit so the steps were slightly slippery because the tower is made out of mainly wood, only the support beams are steel. As I already mentioned, the climb took a while because the tower stretches about 23 metres high (75ft). When we got to the top, the tiny shower had passed and the sun shone through the clouds. 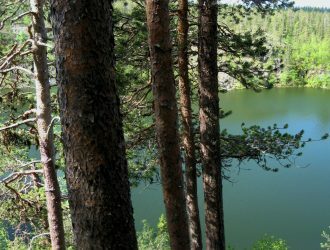 The observation tower is located in such a place that you can easily see a wonderful 360° view of the landscape: lush green vegetation in the estuary next to the water, pine and spruce trees pregnant with cones, and golden fields of wheat, barley and oat. You can easily understand why a Stone Age human would choose this place to settle in. It was very peaceful… only the slight noise of the camera phone of my teenagers making small clicky-noises. We didn’t have binoculars but we did have a proper camera with us so we just zoomed in and out to see some of the birds flying around us in more detail. 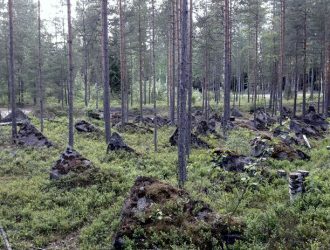 The ridges in the landscape are called Salpausselkä, an extensive ridge system left by the ice age in Southern Finland. We had a few sips of water and a cookie each on top of the tower, leaning against the railings and soaking up the sun before descending back down. An information plaque stood at the foot of the tower, showing where the Stone Age habitation had stood. 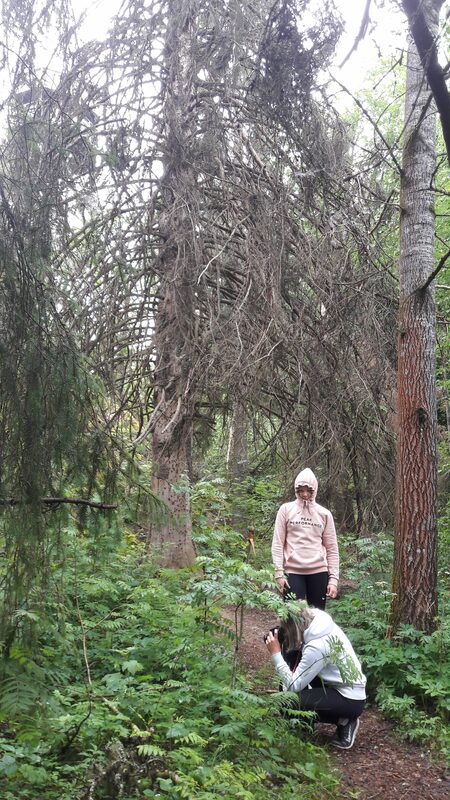 Walking down past the stunning tree again, my sweet teenagers were so enchanted by the greenery and beauty that they wanted to have extra time for to take pictures even though we were being eaten alive by mosquitoes. And mind you, they didn’t take selfies… they actually took pictures of the flowers, the trees, the moss… everything! Needless to say, the visit was a huge success! Car park address: Luhtijoentie 136, Lahti. This address takes you to a small clearing where you can park your car or your bikes there for a short while. It is not an official parking space but you can leave your car there for a little while. However, the area has plenty of private properties so make sure you don’t park your car in someone’s driveway. How to get there: You can get the observation tower either by car, by bus or by bicycle. Car: This is easy: just follow your navigator. Bicycle: If you cycle here, there are narrow but still well-maintained gravel and asphalt roads for bicycles as well as excellent maps. The route from, for example, the centre of Lahti is more or less downhill. Public transport: Buses from Lahti run close to the observation tower and back. You will have to walk about 3km (1,9miles) from the bus stop one way. Check out the timetables here. At the moment of writing, the best buses to the Lintulantie intersection from Lahti are local buses 12, 12B, 12R, and 55, but you can also jump on a bus going from Lahti to Mäntsälä. However, just use the proper address Luhtijoentie 107 to check for the best bus option. Accessibility: Due to the fact that this is a tower with no elevator, the observation tower is not accessible for wheelchairs. The stairs are not very wide but they have good and sturdy railings that cover the gaps for children and adults. It is possible to carry smaller children up the stairs but also have them walk the stairs themselves. Just take breaks. When to go: The best time to visit is any time. If you are interested in seeing birds, then spring, summer, and autumn are the best times. However, the views are amazing any time of the year. What to wear: No special recommendations except that proper shoes are the safest because the stairs of the tower are narrow (and possibly sometimes slippery).